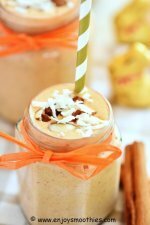 Smoothie making is a lot of fun, and you can create some wonderful tastes, textures and colors. But what happens when things go wrong and your anticipated nectar-of-the-Gods doesn’t turn out as expected. Even the most experienced smoothie maker doesn’t always get it right, especially if you’re experimenting with new ingredients or flavor combinations. The first instinct is to simply pour it down the sink, but that may be a little premature. Such a waste of ingredients. 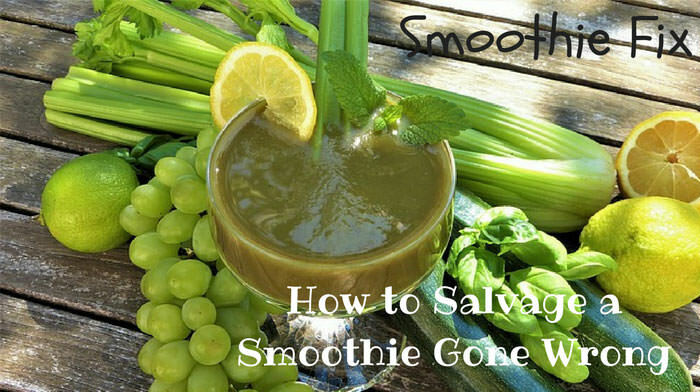 Sometimes a smoothie gone bad can be saved with a little know-how. Here are some smoothie troubleshooting tips and tricks. If your smoothie tastes okay, but is simply a yucky brown color, you could just close your eyes and gulp it down. But we do also eat with our eyes, and food that is not visually appealing isn’t as pleasurable to eat or drink. There are certain rules to follow when combining fruits and vegetables in your blender. 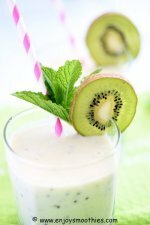 To keep your smoothie green, pair green vegetables and herbs with green, yellow or orange fruits such as kiwifruit, pears, green apples, pineapple, mango, peaches and apricots. Mixing greens with red fruits such as berries, results in brown smoothies. Here is a great Mix-and-Match Ingredient Chart that shows you which fruits to pair with which vegetables so you don't end up with a brown monster. This is probably the easiest to fix. Adding a thickener to your smoothie will easily remedy this problem. 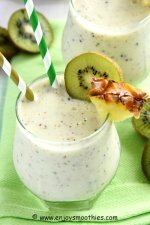 Common thickeners are bananas, avocados, mango, oats, nut butters and chia seeds. Soak the chia seeds in liquid for about 15 minutes before adding to your blender. Ice will also thicken a smoothie, but it also has the effect of watering down the flavor, so I prefer to use frozen fruit. Frozen vegetables will also work. Again this is an easy fix. Just add more liquid. I would advise sticking to the liquid you have already used. Adding water will water down the taste. Start with small amounts, about ½ cup at a time until you achieve the desired consistency. Personally, I don’t mind a little texture in my smoothies. But if you prefer velvety smooth, then try processing a little longer. It also depends on your blender. Some blenders simply can’t handle raw veggies and fruits. The more powerful blenders will usually pulverize most ingredients, but if you don’t have one of these there are a few solutions. Overfilling your blender will also test all but the most powerful of machines. If you have an older or low-powered model, add the liquid, fresh fruit and greens first, blend, then add any frozen fruit last. If adding oats, nuts or chia seeds, add these first without any liquid and pulverize to a powder-like consistency. Alternatively try soaking these ingredients first to soften them before adding to your blender. There are several ways of dealing with vegetables. Carrots can be grated, while others such as sweet potato and beets can be cooked first. In fact, I prefer using cooked vegetables, it adds to the flavor. If using greens, add them to your blender first with a little liquid, give a quick burst to break them down, then add the remaining ingredients. Another cause could be that you simply need to add more liquid. Try adding an additional ¼ cup and see if that rectifies the problem. Some greens such as arugula and dandelion greens can be overpowering with a bitter taste. If you are just starting out it’s best to begin with mild tasting greens such as spinach, romaine lettuce or leaf lettuce. Then move up the chart to the stronger tasting greens such as kale, Swiss chard and collard greens. If you have overdone the green matter, the best solution is to add more fruit. Sweet-tasting fruits such as banana, pineapple, oranges or strawberries are excellent options. Two or three Medjool dates also do the trick. If on the other hand you have overdone the fruits and need to tone down the sweet, sugary taste, this can be done by adding a handful of spinach leaves, some avocado, lemon or lime juice, a pear or half a banana. Remember some fruits are sweeter than others. Fruits that have a high sugar content such as cherries, grapes, pineapple and bananas are naturally very sweet. When making your smoothies, add a low sugar fruit such as blackberries, strawberries, raspberries, blueberries or grapefruit to tone down that sweetness. You’ve made what you think is the perfect smoothie, you take a sip and blah, it is tasteless. This has happened to all of us. Again this is easily remedied, by adding a little sweetness. There are many ways to sweeten a smoothie, without adding sugar. Medjool dates are great, as is ground cinnamon, vanilla, honey and maple syrup. You can also try adding some spice such as grated ginger, turmeric or cardamom. But the main thing to remember when making smoothies is that there are no rules. That’s right. It is all a matter of personal taste. Some like drinking their smoothie through a straw, others prefer to scoop it up with a spoon. Similarly with taste. What is one person’s heaven in a glass is another’s poison. I go by the motto that if it’s healthy, looks good and tastes even better, then I’ve succeeded. But what happens if the above troubleshooting tips don’t work? Perhaps then it’s time to start again.